After our experience on the Norfork River last week we were pleased to find that generation was going to be in our favor for another trip down to see if our Caddis friends were still active on the White River. The weather forecasters were predicting high winds during the first part of the week and severe storms mid week so we decided the winds were the lesser of two evils. Rim Shoals was our choice of destination although there was some thought of taking the boat and maybe seeing if the Caddis were showing themselves at Wildcat or The Narrows. Rim got the vote as water levels were going to be good for accessing the whole area. The parking lot showed that a number of others had the same idea so we expected some company on the stream. Water was low having not received any generation overnight and it was running at almost 60 degrees near the surface on the riffles. The southerly wind had brought the air temperature up and we were feeling toasty with a high of about 75 degrees. Spring was definitely in the air and even the Dogwoods were almost ready to pop. 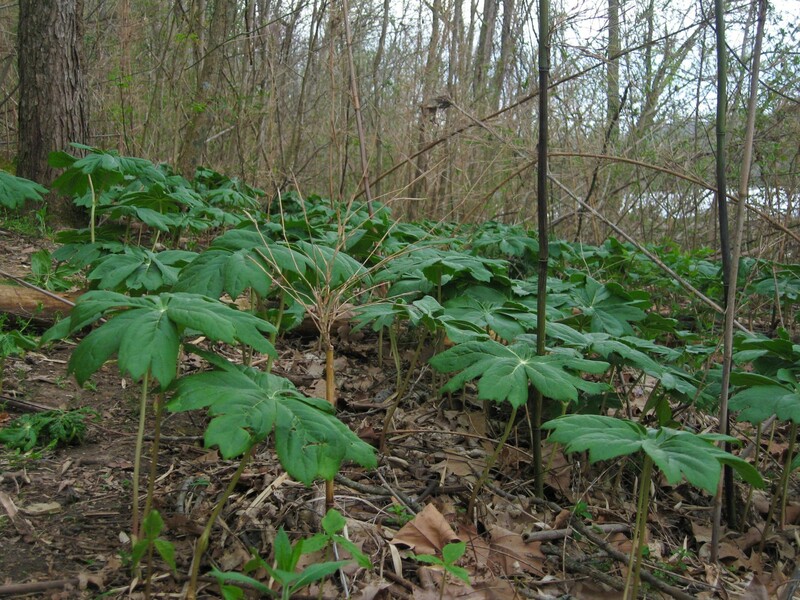 A walk along the bank showed the Mayapples were getting tall but not a single Morel came into my vision range! Only the occasional Caddis was in the air and the first long run had fish working a midge hatch and not showing any interest in a Caddis dry. I decided to swing a few micro soft hackles and these brought some nice rainbows to the net. I moved to the more agitated water in the riffles and changed to my #18 tan caddis which soon brought eager mouths to the surface. The fish appear to have become acclimatized to Caddis being on the water and the arrival of a dry fly was all that was needed to get them up and working. The wind steadily increased as the morning progressed with gusts coming from the south at about 25 mph. At one point there were about 10 or 12 other fly fishers on the main riffle and although some were working with dries the vast majority appeared to working the bottom with nymphs or scud under an indicator. These folks did not seem to be taking many fish and this coupled with the strong winds soon had them heading back to their vehicles with overheard comments of “maybe it will be better at Norfork”! So once again I found myself with the stream almost to myself! The wind continued to blow and gave me more slack line misses than I would have preferred although the fish continued to take my Caddis offering. Caddis did make a minor appearance during the day, once again it was the tan winged with a few of the white winged scattered among them. Takes were subtle and it was easy to miss them. Quite often the fly would just disappear and if you lifted the rod you had a fish on. Although the fish this week didn’t reach the proportions that we had come to expect, they were very healthy and my best of the day was a 16 inch brown. As we changed out of our waders a quick check of the generation forecast showed that the water would be off for Tuesday although the other forecast showed winds in the 30mph region! What to do? Well not being ones to let the weather dictate our activities we decide a night in Mountain Home was in order for a second visit to the water without the 2 hour drive. Tuesday dawned cold and bright with hardly a breath of wind! The parking lot showed that most people had heeded the “Lake Wind Advisory” and stayed away. The first part of the day was a repeat of Monday although this time we had the water completely to ourselves until early afternoon when some folks began to arrive. The wind did make its presence know during the day and we did have gusts that were similar to Monday but they really weren’t a problem in comparison. This time we worked our way down the full length of the Catch and Release area and even fished below for a short time. Towards the middle of the section I took a break for lunch and while munching on my Subway delicacy I noticed something floating in the water near me. 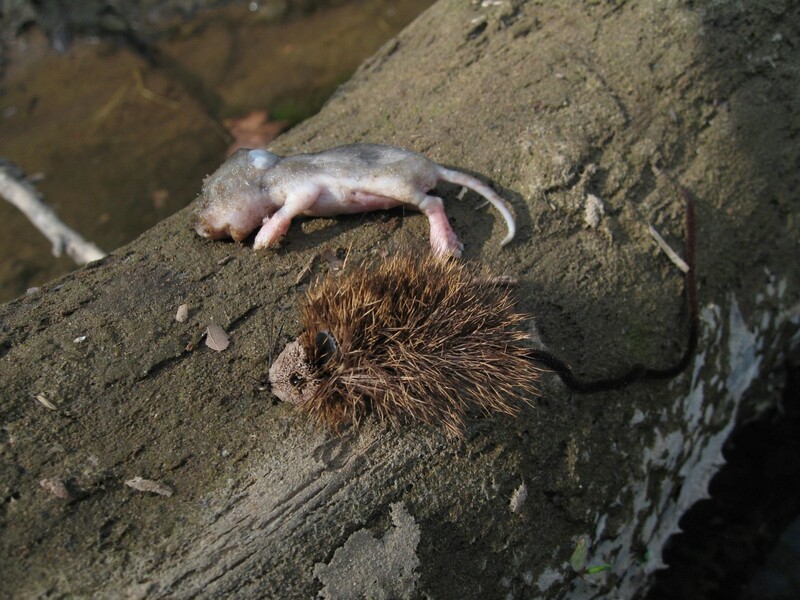 It turned out to be a young mouse (dead of course) and a little staging with my mouse pattern (always have one on me) I took this photograph. You can see why some of the bigger browns caught on the White are taken on this pattern! White Caddis were on the water so it was the #16 furry foam Caddis that became the fly of choice today. So it was another successful day and we felt quite pleased that we had made the decision to stay overnight and fish the second day. Over the years of fishing the White I had heard mention of there being large Black Stoneflies in this water and occasionally I would find a discarded shuck attached to a rock. I had only ever seen the little Black Stoneflies in the air and never one of their big brothers. As we were changing out of our waders though, I felt something crawling up my leg and looking down was surprised to find a Large Black Stonefly! This chap was about 3 inches long with orange coloration around his thorax. I did a bit of research when I got home and found that this was probably the species known as Pteronarcys Pictetii which is otherwise known as the “Midwest Salmonfly.” Here is a link to a website giving more details of the species: Midwest Salmonfly You may notice that this chap resembles the one that is sitting atop my rod in the page header. 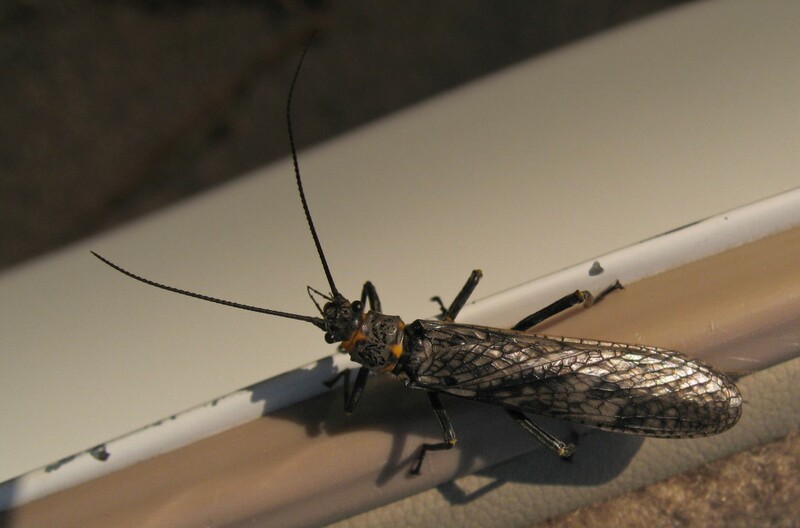 That is a true Salmonfly and I shot that photograph on Slough Creek in Yellowstone. Nice to think we have something in common with that wonderful place eh! They say “One swallow doesn’t make a summer” and I suppose one Stonefly doesn’t make a hatch but it nice to know that our White River supports this species because they are known to prefer un-polluted water so hopefully this bodes well for our “little ol stream”! Here’s hoping the Caddis are still playing next week.